Mayans had a detailed and well-developed written language which they used to inscribe on artistic works and to pen down books. The language comprised mainly of symbols in the shapes of glyphs, which is why Mayan language has been called hieroglyphics. Glyphs, a term used to denote the individual alphabets or symbols, formed the basic unit of the language. There were two types of glyphs in the Mayan language, namely logograms and syllabograms. Logograms made use of an image to depict an entire phrase, for instance the depiction of a god to denote him. Syllabograms used syllables using a collection of images to depict a phrase and were more detailed. Using two types of glyphs, namely syllabograms and logograms, gave the Mayan language a lot of flexibility. This helped the Mayans express their thoughts and history very lucidly. A logogram could be used, for instance, to provide a very precise and comprehensive form of a phrase, usually summed up in a single image or symbol. A syllabogram, on the other hand, was more thorough and brought together multiple syllables to string a single word or phrase. Syllabogram was important because it helped the Mayans use different inflections in the written language. In total, the Mayan language has 550 logogram glyphs and 150 syllabogram glyphs. Mayan also had a number of other glyphs which served as proper nouns in the written language. Using two types of glyphs, namely syllabograms and logograms, gave the Mayan language a lot of flexibility. The Mayan written language is one of the most extensively available languages from pre-Colombian Americas. It is for this reason that the researches have been able to decipher Mayan glyphs and understand Mayan texts. A number of sources provide a rich collection of Mayan glyphs. These include extant Mayan inscriptions, usually found carved in stones of the Mayan monumental structures, or on wooden structures from Mayan times. Inscriptions comprising of glyphs have also been found on Mayan pottery and ceramics. When the Spaniards invaded the Mayan lands, most of the Mayan temples were pulled down. And since books and writing was the sole prerogative of the priests, most of the Mayan literature was destroyed in the burning down of these temples. Some Mayan books, however, have survived and they are a major source of Mayan glyphs. These books are called codices and they were originally written on a sort of cloth made from bark tree. Among the extant Mayan codices are the Dresden codex, Madrid Codex and Paris codex. Mayan epic stories have survived in the extant codices and are a rich resource of the Mayan creation mythologies and religious views. These epics are written in glyphs and narrate many fantastic stories of Mayan gods and heroes. Notable among these is Popul Vuh, a book penned down in the 16th century and narrating mythological and political history of Quiche Maya. Chilam Balam is a collection of Mayan songs and religious prophecies and is also inscribed in glyphs. Apart from being a rich resource of Mayan glyphs, these books are also one of the most important insights into the Mayan civilisation. Deciphering Mayan glyphs can be a hard job. That’s because until the last century, researchers had no idea whether the glyphs represented phonetic sounds or complete symbols. In the last century, it was finally proposed that in any Mayan writing, glyphs represented both kinds of alphabets. It was after this breakthrough that the researchers were able to finally decipher the Mayan language and understand the extant Mayan literature. Given that Mayan language comprised of hundreds of glyphs, they were able to use them in many different ways. This was one of the major factors that added great flexibility to their written language. A single phrase or word could, for example, be represented by a single logogram, or it could be represented using a syllabogram. Even when using syllabograms, Mayans used different combinations of symbols and syllables to write the same word in many different ways. Although Mayans had a fairly advanced written language, the use and knowledge of this language was exclusively limited to the nobility and the priestly class. The priestly class studied and developed language, and wrote down texts in it. If someone wanted to become a scribe in Mayan language, he usually had to hail from the nobility and was first trained by the priests. The language itself was often used as a tool of propaganda and royal and religious announcements. Because the commoners were barred from learning the language, they were overawed by it. In this way, language served as a symbol of power and class stratification in the Mayan society. Although the Spanish conquistadors destroyed a large body of Mayan literature, their arrival also prompted the formal development of different books related to Mayan glyphs. These included dictionaries related to the language and attempts to formulate a written explanation of the system behind the language. Most of this work was carried out by the Franciscan monks who accompanied the Spanish conquerors. Although they failed to decipher the Mayan glyphs, the works penned down by them proved decisive in later successful attempts to understand the language. 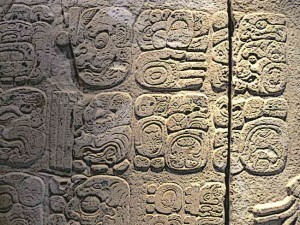 Mayans made use of a written language that utilised different images and symbols. These symbols were sometimes phonetically used to depict a phrase and at other times, a single image directly denoted the intended word. Given the symbols-based structure of the language, it was called hieroglyphics by the Spanish conquerors. Consequently, the individual alphabets used in the Mayan language came to be called glyphs. The Mayan language had two major types of glyphs – logograms and syllabograms. Logograms were direct symbolic representations while syllabograms made use of strings of syllables to write down a word. A number of sources such as extant Mayan architecture, ceramics, art works and codices are the key source of modern knowledge of the Mayan glyphs. It is because of such an extensive body of glyphs that researchers have been successful in deciphering the Mayan language.